Interstate 229 in South Dakota is an urban loop freeway serving the southern and eastern areas of metropolitan Sioux Falls. The route provides a cutoff between Interstate 29 near Tea to the south and Interstate 90 near Brandon to the east. Otherwise I-229 serves commuting interests, providing a faster route to Downtown Sioux Falls than I-29 to the west. Construction completed by November 16, 2016 at the south end of I-229 replaced the I-29 overpasses and realigned the loop ramp from I-29 south to I-229 north. This was part of an I-29 expansion project between Exit 73 near Tea and the 57th Street overpass in Sioux Falls. Phase 1 of the project was completed by late July 2016. Phase 2 followed with the replacement of both the northbound span on I-29 at I-229 and the ramp from I-29 south to I-229 north. Future road work will reconfigure the folded diamond interchange at East 26th Street and Yeager Road. Additional interchange improvements are considered as part of the I-229 Corridor Study. Interstate 229 was completed by 1962.1 Per the 1962 USGS Quadrangle maps, the interchanges with Louise Avenue, East 26th Street and Benson Road were unbuilt. The south end interchange consisted of just a wye with no access from I-29 south to I-229 north or I-229 south to I-29 north. 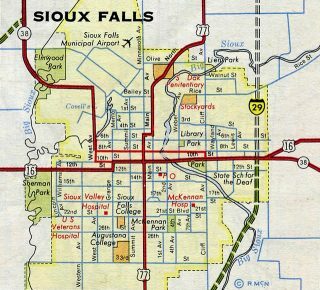 Until 1962, the alignment of I-29 through Sioux Falls was proposed to extend north from where I-229 travels now to Millbank. This took Interstate 29 east of then-U.S. 77 to Tunerville. Rural Interstate 90 advances west from the diamond interchange (Exit 402) with Minnehaha County 121 (478th Avenue) to meet the north end of Interstate 229 next. Photo taken 06/17/15. Interstate 229 loops southward from Exit 400 through Sioux Falls to provide a direct route to I-29 south for interests to Sioux City, Iowa and Omaha, Nebraska. Photo taken 06/17/15. This set of signs at I-229 south was replaced during work to expand I-90 west to SD-115 in 2013. Photo taken by Jay Maynard (01/05/02). The addition of the Marion Road interchange (opened in November 2010) resulted in a new community interchanges identification sign posted for the Sioux Falls area exits from Interstate 90 east. Photo taken by Joseph Barnes (06/04/15). Leaving the full cloverleaf interchange with I-29, Interstate 90 progresses east to span the Big Sioux River on the two-mile approach to Exit 400 with Interstate 229 south. Photo taken 06/17/15. Passing over Cliff Avenue, Interstate 90 is three quarters of a mile out from the half cloverleaf interchange (Exit 400) with I-229 south. Photo taken 06/17/15. The diamond interchange (Exit 399) with Cliff Avenue (Business Spur I-90 & SD 115) was converted to a Single Point Urban Interchange (SPUI) by November 2013. Associated work along I-90 added an auxiliary lane eastward to Interstate 229 south. Photo taken 06/17/15. Interstate 229 heads south back into Sioux Falls as I-90 leaves the area via Brandon to southwest Minnesota. Photo taken 06/17/15. Replaced overheads on I-90 approaching Exit 400 indicated traffic to keep left or right for the respective freeways. Now a simple quarter-mile overhead for I-229 is posted here. Photo taken by Jay Maynard (01/05/02). The former off-ramp configuration of Exit 400 to I-229 south. Photo taken by Jay Maynard (01/05/02). The first signs for the pending junction with Interstate 90 appear on the Benson Road overpass. Most other bridge mounted signs in Sioux Falls have been removed by 2015. Photo taken by Jeff Morrison (06/26/06). Interstate 229 continues north by an industrial park area between Benson Road and the freeway end at Interstate 90 and Minnehaha County 125. Photo taken 06/17/15. Exit 10A departs the northbound I-229 mainline at the East 60th Street overpass. 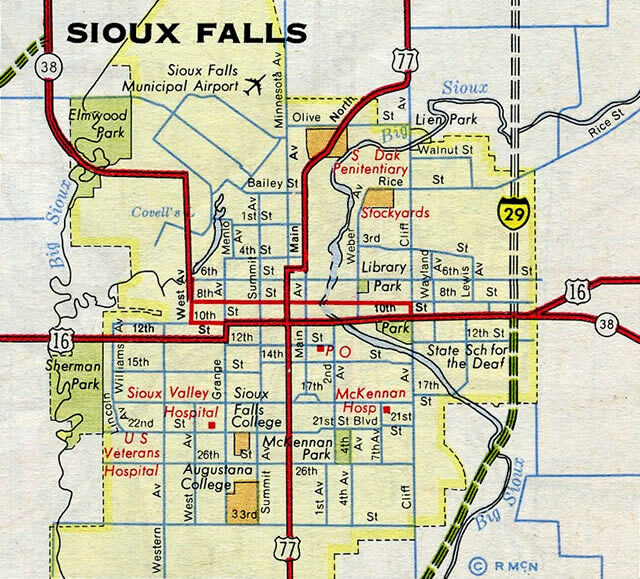 Control cities are not used for at any of the Interstate junctions in Sioux Falls. Photo taken 06/17/15. A loop ramp follows onto Interstate 90 west across the north side of Sioux Falls. The freeway mainline otherwise defaults onto Minnehaha County 125 northward toward Renner. Photo taken 06/17/15. County Road 125 (476th Avenue) stems north through agricultural areas and a handful of rural subdivisions on a parallel alignment to South Dakota 115 (old U.S. 77) to the east. Photo taken 06/17/15. East 60th Street spans I-229 as Exit 10A departs for I-90 east. A new sign bridge replaced these overheads. I-90 still sees no control point in either direction however. Photo taken by Jay Maynard (01/05/02). This ground level sign used to direct motorists onto the loop ramp for I-90 west from the freeway end of I-229 north. It was replaced by a new sign bridge. Additionally the bridge mounted signs in the background referenced simply Township Road, for what is now signed as County Road 125 north. Photo taken by Jay Maynard (01/05/02). County Road 125 previously transitioned into a gravel road a quarter mile beyond the exchange of I-90 and 229. The road is now fully paved northward into Mapleton township. Photo taken by Jay Maynard (01/05/02). CR 125 emerges from a rural area of Mapleton township and upgrades to a divided highway at the half cloverleaf interchange between Interstates 90 and 229. Photo taken 06/17/15. A begin shield stands ahead of the loop ramp bringing motorists from I-90 west onto I-229 south. Photo taken 06/17/15. A shield assembly referenced motorists to stay left for I-229 south at the on-ramp from I-90 west. There is no access to I-90 from CR 125 otherwise. Photo taken by Jay Maynard (01/05/02). What was the first southbound shield posted for Interstate 229 retained the state name until sometime before 2007. Photo taken by Jay Maynard (01/05/02). Interstates 29 and 229 split at the southwestern suburbs of Sioux Falls. Growth in the Tea area west of Exit 73 adds commuter traffic to this partition. A third northbound lane was added from the Tea interchange through Exit 75 as part of the 2015-16, I-29 expansion project. New signs were installed for the split as well. Photo taken by Jeff Morrison (06/26/06). Entering the trumpet interchange (Exit 75) with Interstate 229 north on I-29 north. I-229 provides a direct route to Downtown via Business Loop I-229. Photo taken by Jeff Morrison (06/26/06). Approaching the commercialized diamond interchange (Exit 77) with West 41st Street, southbound motorists see the first guide sign for Interstate 229 north. Photo taken 06/17/15. Passing under West 57th Street, I-29 south departs Minnehaha County and next meets the loop ramp for return access to I-229 north. Photo taken 06/17/15. Interstate 229 parallels a railroad line northeast to Exit 5 with East 26th Street. Construction through 2016 relocated Exit 75 slightly north to improve the ramp curvature. Photo taken by Jeff Morrison (06/26/06). Passing under Western Avenue, two miles north of Interstate 29 on I-229 south. Photo taken 06/17/15. The final exit on southbound Interstate 229 is Exit 1C to Louise Avenue and The Empire Mall area. Photo taken by Jeff Morrison (06/26/06). During a spring season snowstorm, southbound Interstate 229 passes under the Louise Avenue overpass, one mile ahead of the trumpet interchange (Exits 1B/A) with I-29. Photo taken by Jeff Royston (03/18/05). Avera Heart Hospital appears just south of the final mile of Interstate 229 beyond the parclo interchange with Louise Avenue. Photo taken by Jeff Morrison (06/26/06). The final reassurance shield for Interstate 229 south. Photo taken by Jeff Morrison (06/26/06). A wintry look at the partition of traffic for Exit 1B back into Sioux Falls and the Exit 1A mainline connection to I-29 south to Sioux City, Iowa. Photo taken by Jeff Royston (03/18/05). The south end of Interstate 229 during 2015-16 construction to expand Interstate 29 between the Tea interchange and West 58th Street. Photo taken 06/17/15. Page updated January 26, 2017.